Police are treating this morning’s alleged hit and run by a black Hackney cab in Pollok as attempted murder. A 24 year old man, who was with his 22 year old friend, flagged down a passing taxi in Dalmellington Road, Crookston, at around 12.10am. Police say the taxi refused to take them, and that the 24-year-old was then deliberately run over by the taxi driver. The injured man was taken by ambulance to the Queen Elizabeth University Hospital in Glasgow suffering from serious head injuries. Medical staff describe his condition as critical. The friend was not injured. The driver of the taxi involved is described as of Asian appearance, aged 30-40, medium build, short dark hair and wore a pink coloured top. 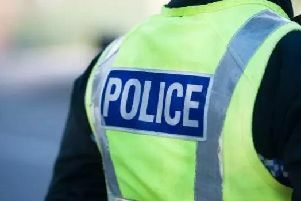 Detective Inspector Greig Wilkie of Greater Glasgow CID, said today: “From our investigations so far, it would appear that the two men had left a party nearby and had asked the taxi driver to get a lift home. “However, the driver, for whatever reason, refused to take them. It then appears that the injured man went on to the road which is when the taxi deliberately drove at him. “The taxi didn’t stop and drove off along Dalmellington Road, towards Crookston Road at Raeswood Road. “On hearing a commotion outside, people from nearby houses came to assist the man until the ambulance arrive. “We are in the process of tracing them and others who were in the area, including the occupants of another black Hackney taxi who had been dropped off nearby just at the time of the incident. He added: “This was a shocking incident, which has left a young man very seriously injured. “I would appeal to the taxi driver who involved to come forward to police himself as soon as possible. “I would also ask anyone who has information that will assist officers with their enquiry to contact officers at Govan Police Station via 101.